A lad 'Gautam' witnesses the treacherous murder of his parents. He is chased by the goons but somehow manages to escape. He finally experiences a shock when he suddenly runs into a Police Jeep and as a result, only remembers the faces of the murderers. Gautam's quest for "Who he is", "Who his parents are" and in the process, his hunt for the murderers forms the rest of the story. Mahesh was the highlight on screen. He enacted the role to near perfection. I'd rate this his best movie in terms of his acting prowess. His Styling (costumes and Hair Style) were crafted very well. He seems to have built a good physique for this film. I was watching an interview of Mahesh recently in which the interviewer (of course, a lady) asked him, "Sir, We were very eager to see your six-pack abs and you ended up showing just your bare-back. So, when will we get the fortune of seeing your front". Well readers, Don't read too much into this. Kriti Sanon was okay. Little skin show, and little scope to act, she fitted the bill. Sayaji Shinde & Srinivasa Reddy entertained for the meagre 10-minute screen space they shared. Surya was very confusing as a psychiatrist. Or was he an ex-psychiatrist suffering from a psychiatric disorder??? Nasser was very convincing and he looked really different towards the end. Posani tried providing some comic relief. The surprise package of this movie is Gautam Krishna. It's better to watch it on screen than get carried away by my opinions. 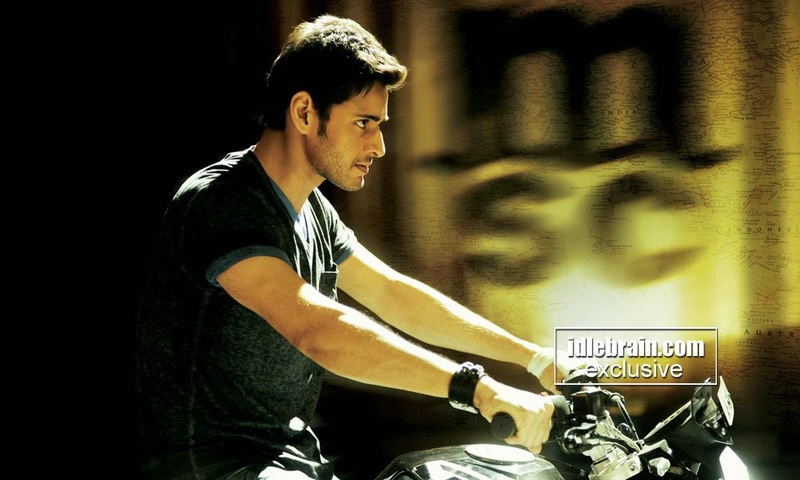 Sukumar is normally known for the technical quality in his films and he took it to the next level with 1-Nenokkadine. When you normally have an outrightly creative director wielding the megaphone, there is no end to newness in the film. I am normally awed by Sukumar's creativity in his title cards and he definitely didn't disappoint me this time too. Cinematography by Rathnavelu is of top notch. Of all the movies I watched in the recent past, the best cinematography was by PC Sreeram for Ishq. However, I felt Rathnavelu somehow crossed PC Sreeram. The Art department also deserves a special mention here. Stunts by Peter Hein are top-notch. The bike chase post-intermission and the speedboat chase pre-intermission definitely deserve a mention. (Sukumar, don't you think the speedboat chase was a misfit in the screenplay?? It could have very well been avoided to save some boring run-time). DSP was a dud on the Audio but he was extraordinary when it came to re-recording. The background score really haunts you throughout the movie and in the end, the same haunting tune transforms into a cute melody towards the climax. Hats-off DSP. Choreography by Prem Rakshit was decent. The moonwalk-ish step in You r my Love song deserves a mention. I found the editing (I think it's Kartheeka Srinivas) very inconsistent, more towards the fag end of the movie, probably because of the cuts involved in reducing the run time. The Production values are very high. The producers deserve an applause for not compromising on the budget for the film as well as the promotional expenses. The story is very simple, but the screenplay is very complex. And when you have a creative director wielding the megaphone, there is no end to newness in the film. However, the plot appears very confusing thanks to the complex screenplay. Sukumar tried justifying almost all the elements of the protagonist in the screenplay (his thirst for revenge, his psychological disorder, his hunger to understand his past, etc.). However, he took too long to test the patience of the viewers. That is where the movie seemed to have lost its charm. The term "Integration Disorder" that Sukumar used has been brought into existence by the Japanese, in order to avoid the ambiguity associated with Schizophrenia. He seems to have researched just enough to design the lead character to suit the symptoms of this disorder. While Mahesh's acting was praiseworthy throughout the movie, I loved the following scenes. 1. The scene in the Cemetery where Mahesh talks to a child about the death of his mother. The promotional efforts of the film deserve a mention. God knows whether the movie made a whooping business of 70+ crores prior to its release, but that was what was claimed by the producers. Income Tax Officials are on a watch. Beware!!! IMDB rating of 9.2. Oops... As an Indian and more as an Andhraite, i'd have felt really happy for seeing a Telugu film top the IMDB charts, but Damn it. Is IMDB crazy?? Amir Khan has sought to remake this film. What?? Even before watching the movie, how could he, unless one has spent time with him and explained him the script. Youtube hits: Fed up of seeing the records put up these days by the filmmakers for the youtube hits. Come on guys. pls put an end to these innovative ways of declaring crappy films better. Thankfully the producers haven't tried garnering sympathy by leaking out copies pre-release and then raising a hue and cry of piracy post-release. Minus some nonsense, This movie is definitely ahead of its time for Tollywood. So, if you love those Hollywood psychological thrillers, go watch it. P.S. Being an Engineer and a Management graduate, I could not resist putting some numbers. So, my rating for this movie is as follows. Overall, I'd rate it a 3.5 on 5.